Whatever you call your product, it's going to say something about the way you view it and the way you intend others to view it. This links in with beliefs, stereotypes and relationships as much as anything else in the product. If you call it a "roleplaying game" it sets the product as fairly conservative. It fits in with the dozens of other products on the shelves, and thousands of games online that also call themselves roleplaying games. People who are familiar with this type of product know what to expect from it. A GM, a bunch of players a system for resolving actions and conflict, a way to set up scenarios. The game may have points of difference with the others (and hopefully it does, because otherwise there is no point in a consumer buying it or wasting their time on it). Just a few more images from the ongoing work in progress. Sometimes you just know someone is different, they haven't spoken yet, they have barely encountered the outer limits of your personal space...but you get the feeling. Let's assume that this isn't a skin colour thing, and the clothing they wear doesn't have anything specifically "different" about it. Maybe it's something about the way they hold themselves, perhaps they are a bit more curious in their observation around them, perhaps their actions are slightly defensive and guarded...not enough to really alert you that something is wrong, and when you look again that moment might be gone. But there are enough half-caught glimpses, that you notice something. I don't know if other people see this in the world around them. I don't know if it's just an instinctive things that has been picked up through decades of work in customer service, and therefore dealing with hundreds of thousands of people over the course of my daily life. I've been asked to create an manga style avatar of myself. This is probably because my profile picture on every form of social media is an image of my dog, Okami. I hardly ever post pictures of myself, and most images of me on the web have been taken and tagged by other people. 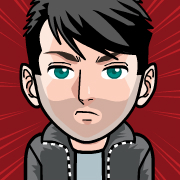 So, even though it's not an exact replication of me...here's my manga avatar. Enough of that...back to game and design stuff. I've used it to create a few alternate face illustrations for the Walkabout explanatory comic. They don't quite match the characters as currently drawn, but I might be able to poke fun at this as a part of the comic (Ed says "Hey that doesn't look like me"...Alice reponds "I could only find a picture of your old haircut, I had to do the same for myself"). 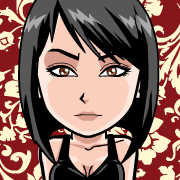 ...and because I was in the mood for playing around, I developed an avatar for one of my LARP characters from a few years back....Yukiko (she was fun to play). A lot of the walkabout explanatory comic will be drawn from actual events that have occurred during playtest sessions or convention session. But the whole sequence will be an amalgam of various incidents that help illustrate the specific rulings that need to be illustrated. Since different people were present in different games (and to protect the innocent), the five characters in the comic will be given new names. I like the idea of sequential starting letters for names, it makes things easier when illustrating things...Alex, Bill, Charlie, Daniel, Eric; these can be quickly rendered as A,B,C,D and E in images such as relational diagrams or showing how two players interact with one another. But these are all male names, and pretty western/European (that's not to say there aren't asians, aboriginals or members of other ethnicities with these names, it's just stating that the names have fairly european origins). It seems there are quite a few people interested in the work being done on the Walkabout comic; so that gives me the motivation to do more work on it. In theory, I could repeat the same images over and over when different characters are talking to one another give them some different backgrounds and modify the scale to make the repetition not so obvious. But since I've had a few hundred looks at the post in the last 24 hours, that tells me it's worthwhile doing a bit more work on it. So maybe a few more poses of each character, some varied expressions (for when things go well or when things go badly), and a few more illustrations of how the mechanisms of the game work. Regular readers will be aware that I'm writing up a comic to explain the Walkabout RPG. 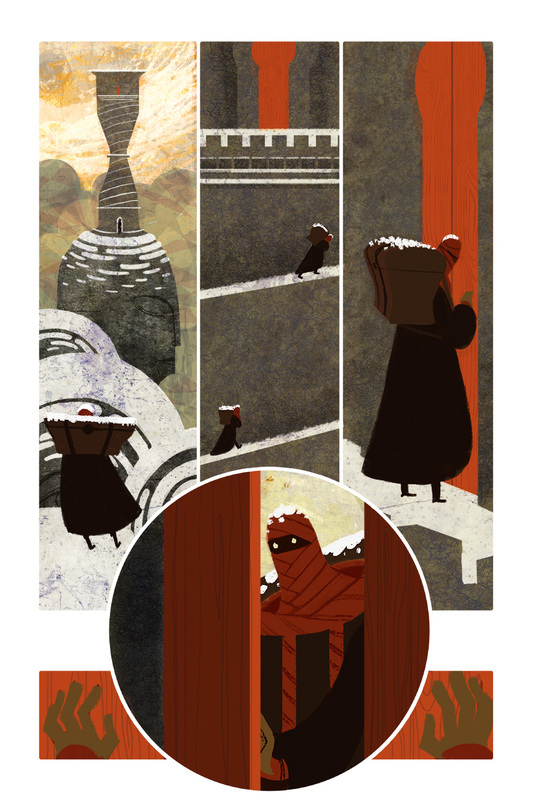 The following images are some of the work in progress pages. There's a lot more work to do, but things seem to be falling into place. I spent another day yesterday at combat practice for the new Fantasy LARP that has set up in Sydney. There were about 10 people participating, but four of them were new faces. In total there are probably about 30 players who will be there on a semi-regular basis (I've only gone to two out of the three events so far). The LARP has been mostly focused on getting players familiar with the way fighting works, proper "adventures" will come in the next couple of months. This game is basically medieval, just like most fantasy games. There is no specific epoch, so plate armour might appear alongside quilted armour, roman-style breastplates, and samurai armour. The only thing that's been specified is that there are no gunpowder weapons...and for the purposes of game safety (and compliance with state laws) no crossbows. This instantly made me think about the unspoken dangers that might still lurk in the cities of the world for the Walkabout setting...actually, the dangers that lurk above the cities. It all depends on when the apocalypse occurs...how far in the future until the days of darkness arrive? (It also implies that the electromagnetic pulse encompassing the globe had less of an impact on military technology than would have been originally thought...or maybe there is a ghost in the machine). Take a look, but don't don't say I didn't warn you. Go over and have a look at this comic, there's not a lot to it on the surface, but there are hints of depth and a far richer world to be explored. There's a form of literary analysis common used for analysing noir and crime stories. I can't remember what it's called (it might possibly be "russian formalism"). If uses the concept that an investigative piece actually has two stories, the "subject" and the "fable". The subject is the story unfolding _now_, while the fable is the story being revealed...the story that has already occurred. The Subject is capable of changing with the decisions of the protagonist(s), while the fable remains a fixed point. Is someone cynical and critical because they find it harder to create things and easier to destroy the work of others? Does someone find it harder to create things and easier to destroy the work of others because they are cynical and critical? What comes first? Do either come first, or are they a part of a self-perpetuating feedback loop? Walkabout vaguely addresses this premise, but doesn't go too far into it. It's just an idea I'm thinking of exploring further in a potential players guide later. 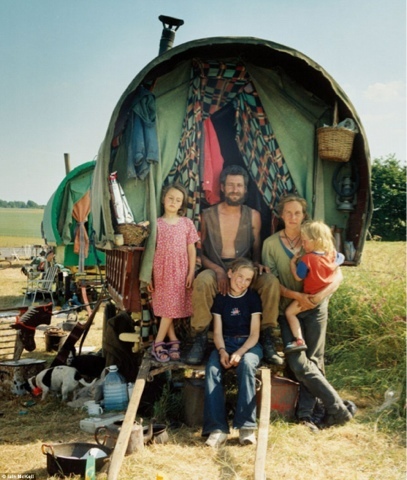 In the Walkabout setting there are nomads who derive a lot of their culture from the ways of the gypsy people and travellers who have existed on the fringes of society throughout history. Have these people simply appropriated the culture of a lost people, or are they proud of an ancient heritage? It's hard to tell...but the settled survivors of the world view them with distrust in much the same way that modern settled people view travellers with distrust. They aren't subject to the same laws as everyone else, they are free spirits. I know a Hungarian, if you mention the word 'Gypsy' to him, he starts on a five minute monologue about how they are the scum of the earth, criminals who don't deserve to live, and far worse. I know other people who view gypsies with a romantic eye. The truth is probably somewhere between these, and the stereotypes are clearly only a fragment of the whole (like every other stereotype). I'm studying at University again. This semester, one of the topics I'm studying is "Texts and Traditions"; the theme of the topic for this semester is "Autonomy". This covers questions like "Do we really have control of our own destiny? ", "What choices in our lives are actually ours to make? ", "How does society impact on those changes?". In this regard we are looking at Oedipus Tyrannus to examine some of the early roots of autonomous thinking in the western canon, then we move on to Hamlet, and finally Frankenstein to understand how autonomy was pictured in an age of scientific enlightenment. It looks like an interesting subject where we examine the ways authors have injected a similar theme into their works over the ages. We examine a theme in the context of the setting, in the choice of words and decisions made by the characters and in the overall plot of the narrative. I promised that as soon as I had an operating scanner again, I'd post a few of the maps I've been working on for towns in Walkabout. Still a lot of work to do on these, such as adding in some buildings, colouring and fatiguing them, and maybe adding some names/notes. But they're coming along nicely. After my last post, I've been thinking about an issue that's sort of related to "Exception Based Design", but it moves in a different direction. 3rd Edition D&D (and 3.5) released under the open game license were great for the hobby in some ways, but terrible for the hobby in others. They were possibly the ultimate incarnation of "Exception Based Design" where every sourcebook created new exceptions to the core rules, and every character filled specific niches in game-mechanisms and storytelling potential. In the mid 2000s, there were dozens/scores/hundreds of companies producing sourcebooks with the core System Reference Document of the OGL as their basis. Every one of these wanted to have a point of difference about it, so it created new exceptions. I've seen a few posts lately discussing the topic of 'exception based design'; I didn't really look at them too carefully when they first popped up on my radar, but now there have been enough of them to pique my interest. Tonight I've done a quick Google search to see what it's all about. I had some vague ideas, having done some software programming and web design (where the most common piece of exception based design is making sure a web-page works for Internet Explorer). They each come at the concept of Exception based game design from slightly different angles, but that helps give a better perspective on why some designers choose to use it casually, while others focus on it. What happened in the Dark Days? For Walkabout, I've deliberately left the apocalypse a bit vague and undefined. What happened to tilt the earth? What happened during the nuclear winter when the cloud of volcanic ash filled the earth's sky? What madness descended on the remnants of humanity when their nightmares manifested? I think I've found a good inspiration for this period in the game's history. I haven't read through it all yet, but there are inspirations for proto-outlander mutants, spirits (manifesting as monsters and aliens), Geiger counters and folks descending into all degrees of madness. It could easily serve as backstory to a session. I'm terrible with these things. I read a post the other day (it was on my G+ stream, and linked back to a blog article). The general nature of the post stated that roleplayers tell stories in the form of a book, the assumption here is that single games might be chapters of that book, but the presence of all players was generally needed for the ongoing continuity of the book. The author went on to say that maybe roleplayers should abandon the concept of telling stories in book form, it might make the hobby more approachable if stories were told in the paradigm of television. This would mean taking each session as an individual episode and an overall chronicle might be viewed in the form of a TV series. If the story catches on, then you run a second season exploring different aspect of the world. The author seemed to think that this was a marvellous construct of his own devising.